College is an exciting and fun time, but it does have its tough parts. There's homesickness and stress that you will be dealing with in college. It sounds odd, but one of the ways to help both of those things are with your dorm room decor. Your dorm room decor makes your college dorm room feel like a little home you've created for yourself. When you've created the perfect little home away from home for yourself, you'll look forward to coming back to your college dorm room every day to rest and relax. Your college room decor is about more than your dorm bedding when you're creating a relaxing environment. Believe it or not, your wall decorations for dorms also make your college dorm room a relaxing and calming environment. When college is stressful and you're homesick, you'll want some inspirational college wall decor in your dorm essentials to help you get through the tough times. 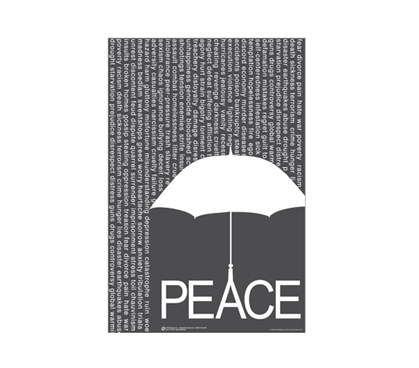 One of those dorm necessities is our Peace Umbrella Dorm Room Poster. This college poster has an amazing design. The idea of this dorm wall art item and the look of it are both soothing and calming for dorm room decor. This cheap dorm supplies item features a white umbrella with the word "Peace" in large letters. 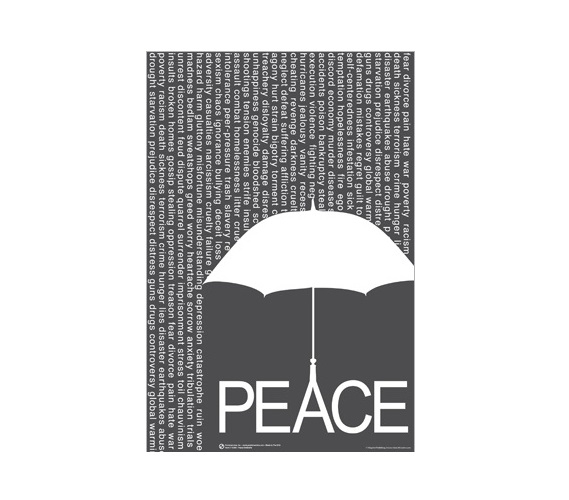 It looks like ordinary rain falling on and around the umbrella at first, but when you look closely, you see that it is actually hurtful words that are raining down and falling off of the peace umbrella. The concept of this dorm room decor dorm essentials item is soothing. When you're having a tough day in college, simply look at this calming college poster to help yourself get through and have some amazing college wall decor at the same time.